Participating in a clinical research study is a brave and selfless act. We don’t know what the outcomes of each trial will be. But what is learned from these studies may improve the screening, diagnosis, treatment and prevention of disease for future patients like you. There are many things to consider before joining a clinical research study. Here we have provided answers to some frequently asked questions to help you make an informed decision as to whether or not research is right for you. For questions not covered here, please contact us at (206) 342-6915. Questions and answers in this section are included courtesy of the National Library of Medicine . Who sees my clinical data? How should you prepare for the meeting with your research coordinator or doctor? A placebo is an inactive pill, liquid or powder that has no treatment value. In clinical trials, experimental treatments are often compared with placebos to assess the treatment's effectiveness. In some studies, the participants in the control group will receive a placebo instead of an active drug or treatment. All clinical trials have guidelines about who can participate. Using inclusion/exclusion criteria is an important principle of medical research that helps to produce reliable results. The factors that allow someone to participate in a clinical trial are called "inclusion criteria" and those that disallow someone from participating are called "exclusion criteria". These criteria are based on such factors as age, gender, the type and stage of a disease, previous treatment history and other medical conditions. Before joining a clinical trial, a participant must qualify for the study. 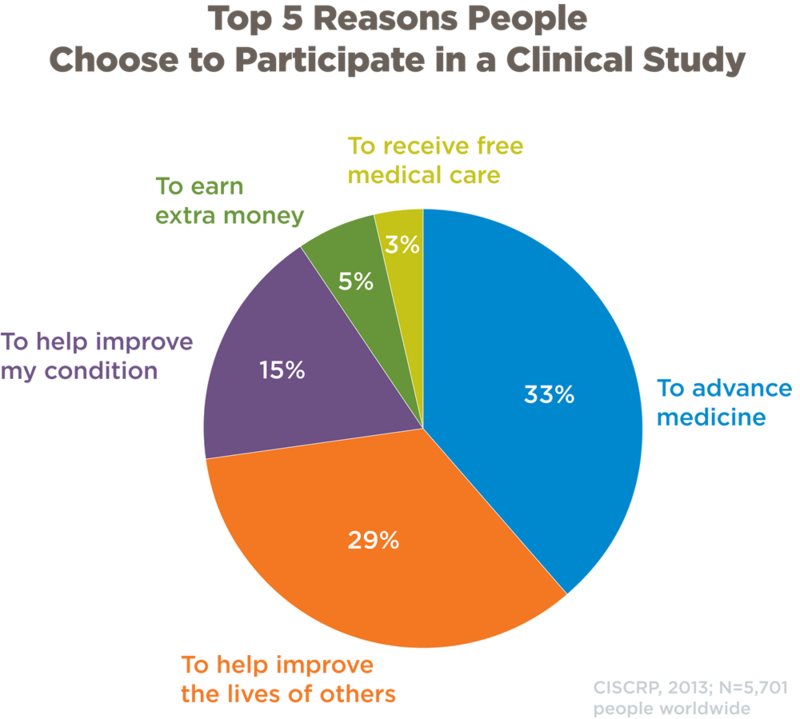 Some research studies seek participants with illnesses or conditions to be studied in the clinical trial, while others need healthy participants. It is important to note that inclusion and exclusion criteria are not used to reject people personally. Instead, the criteria are used to identify appropriate participants and keep them safe. The criteria help ensure that researchers will be able to answer the questions they plan to study. The clinical trial process depends on the kind of trial being conducted. The clinical trial team includes doctors and nurses as well as social workers and other health care professionals. They check the health of the participant at the beginning of the trial, give specific instructions for participating in the trial, monitor the participant carefully during the trial and stay in touch after the trial is completed. Some clinical trials involve more tests and doctor visits than the participant would normally have for an illness or condition. For all types of trials, the participant works with a research team. Clinical trial participation is most successful when the protocol is carefully followed and there is frequent contact with the research staff. We may disclose information to researchers with your authorization, or without your authorization in some cases if the research has been approved by an Institutional Review Board (IRB). For example, a researcher may seek permission from an IRB to look at historical medical data in charts without obtaining an authorization from each person. In these cases, the IRB will determine if using your health information without your authorization is justified, and make sure that steps are taken to limit its use. Additionally, we may allow researchers to review your health information to assist them in developing research or we may contact you to ask if you would like to participate in a research study. In all other cases, we must obtain your authorization to use or disclose your health information for research. A more detailed explanation of our Privacy Practices can be found here. The protocol may require more time and attention than a non-protocol treatment, including trips to the study site, more treatments, hospital stays or complex dosage requirements. You should know as much as possible about the clinical trial and feel comfortable asking the members of the health care team questions about it, the care expected while in a trial, and the cost of the trial. The following questions might be helpful for the participant to discuss with the health care team. Some of the answers to these questions are found in the informed consent document. The ethical and legal codes that govern medical practice also apply to clinical trials. In addition, most clinical research is federally regulated with built in safeguards to protect the participants. The trial follows a carefully controlled protocol, a study plan which details what researchers will do in the study. As a clinical trial progresses, researchers report the results of the trial at scientific meetings, to medical journals and to various government agencies. Individual participants' names will remain undisclosed and will not be mentioned in these reports. Every clinical trial in the U.S. must be approved and monitored by an Institutional Review Board (IRB) to make sure the risks are as low as possible and are worth any potential benefits. An IRB is an independent committee of physicians, statisticians, community advocates and others that ensures that a clinical trial is ethical and the rights of study participants are protected. All institutions that conduct or support biomedical research involving people must, by federal regulation, have an IRB that initially approves and periodically reviews the research. Please contact us at 206-342-6915 for more information.